William Chyr, Manifold Garden Environment, Shot 1, 2015, Chicago. Courtesy of the artist. 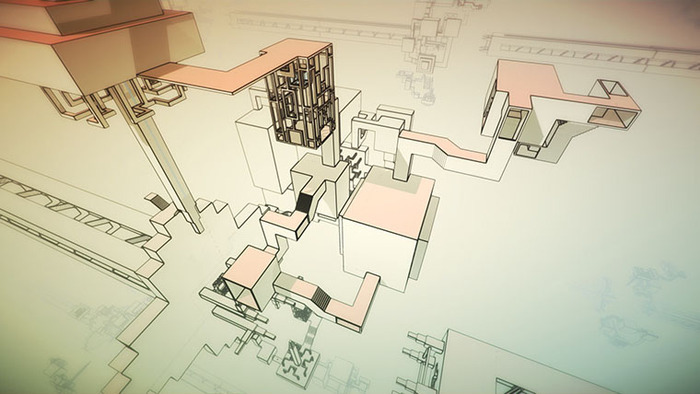 Manifold Garden is an exploration puzzle game that imagines a universe with a different set of physical laws. 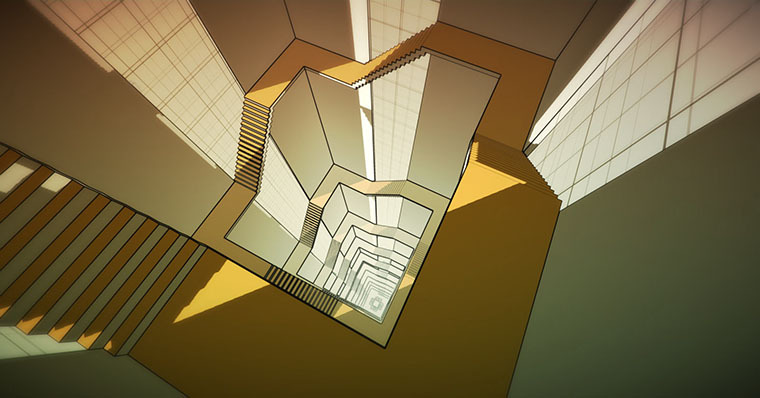 It is set in an architectural environment filled with mysteries, reminiscent of certain M. C. Escher artworks, where the game player utilizes a unique gravity manipulation mechanic to turn walls into floors. 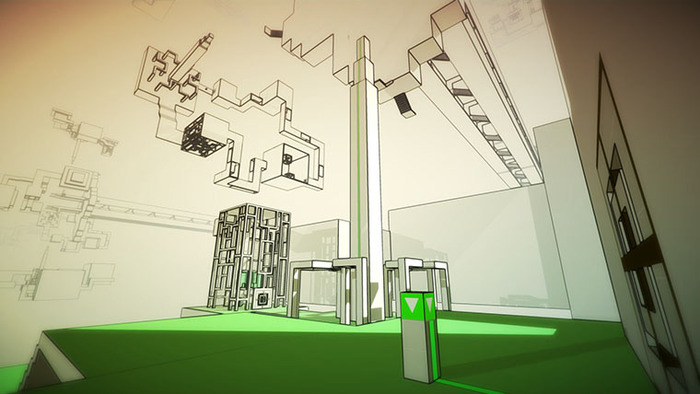 Players also manipulate perspectives as they navigate mindboggling architecture designs. The game is being designed by Chicago-based artist and physicist William Chyr and is set to be released on Playstation 4, PC, Mac, and Linux in 2016. VGA is organizing an artist’s residency with UIC Maker Space that will include game development educational workshops for students and the public. The project will culminate in a one-night exhibition at Mana Contemporary, which will feature prints of game environments, select video and animation, and a unique, immersive installation environment that places the viewer within a projection of the game itself. William Chyr is an artist working at the intersection of art and science. His work spans a variety of media, including web, print, and installation. Drawing inspiration from both cultural artifacts and scientific knowledge, he creates platforms and systems that replicate processes found in nature. Chyr holds a BA in physics and economics from the University of Chicago. He lives and works in Chicago. As an installation artist, he has exhibited works at the Lawrence Arts Center, Telus Spark, and High Concept Laboratories. Some of his more notable past creations include a limited-edition art label for Beck's Beer and a crowdsourced novel, The Collabowriters. Chaz Evans, VGA director of exhibitions and programs, is an artist, educator, art historian, and curator working at Northwestern University. He has taught courses on creative programming, web art, moving image art, and games. He holds an MA in art history and an MFA in new media art from University of Illinois at Chicago. UIC Maker Space is operated and run by UIC's New Media faculty, students, and volunteers. Maker Space utilizes arts and science, craft and technology, to explore creative solutions to the world's problems. From amateur tinkerers to professional designers, the space is designed with a variety of experiences levels in mind. Mana Contemporary is a groundbreaking venture that brings together influential artists, collectors, galleries, dealers, and institutions to create a single community whose purpose is to advance the production and exhibition of art. It is a dynamic space in a beautiful new arts complex located in a cluster of warehouses and factories in the Pilsen neighborhood of Chicago. Founded in 2013 in the lively game community of Chicago, Video Game Art (VGA) Gallery is a nonprofit art organization that increases cultural appreciation and education about one of the most important mediums of the twenty-first century—video games—through exhibition, study, and sale.